Combine sake, salt and sugar in a bowl and mix well. Rub salmon thoroughly with the mixture, then add half the remaining mixture to a zip-lock bag and lay it flat. Place salmon into the zip-lock bag on top of the layer of curing mixture, then top salmon with remaining mixture (alternatively you can use cling-film to tightly wrap the salmon in the cure, but a zip-lock bag is less fuss). Seal the bag, place on a small tray, place another tray on top and add cans to weigh it down. Place in baking dish and refrigerate for 12 hours, then turn the fillet over, ensuring the mix is evenly distributed around the salmon, and refrigerate for another 12 hours. Carefully remove the salmon from the mixture, discarding any liquid. Rinse it gently under cold water and gently pat dry with paper towel. 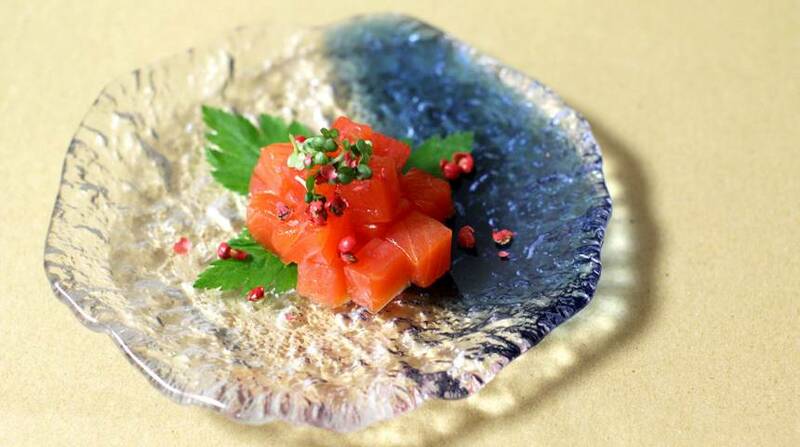 To serve, slice salmon on the diagonal, or cut it into cubes. Store any leftover salmon in plastic wrap in the refrigerator for up to one week.